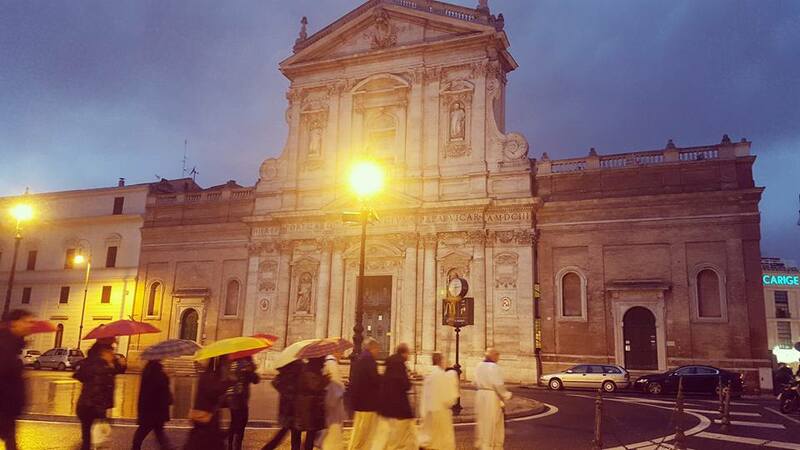 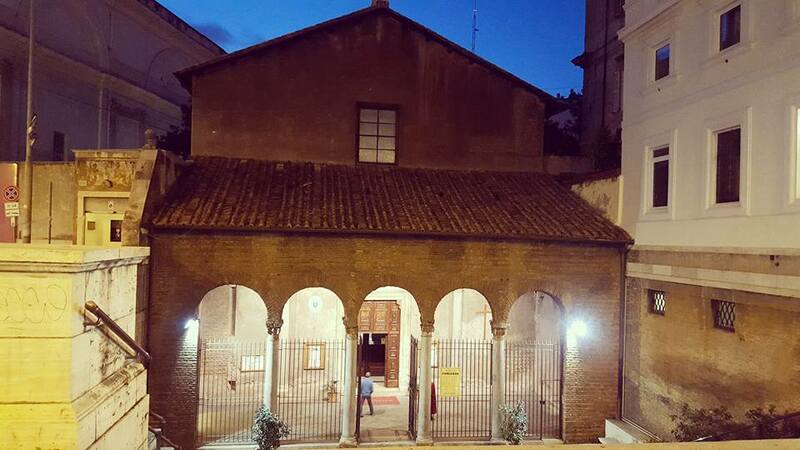 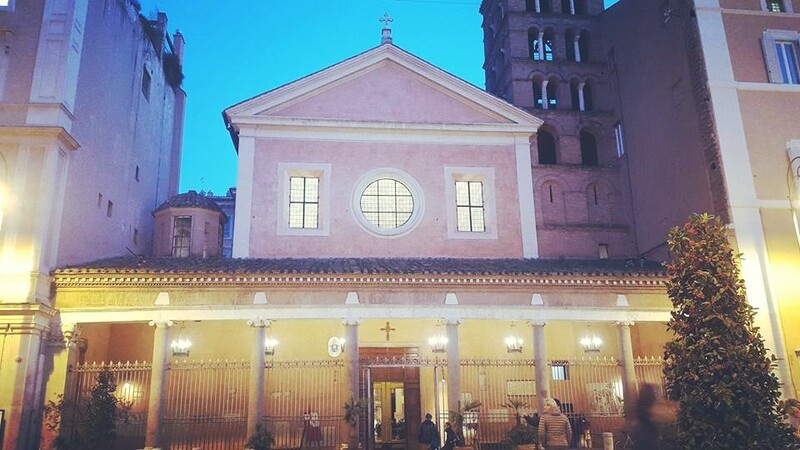 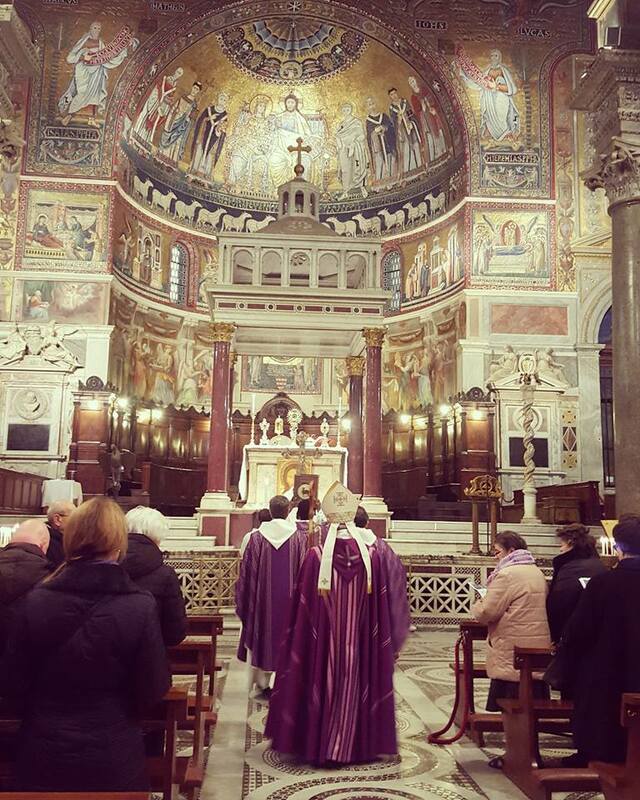 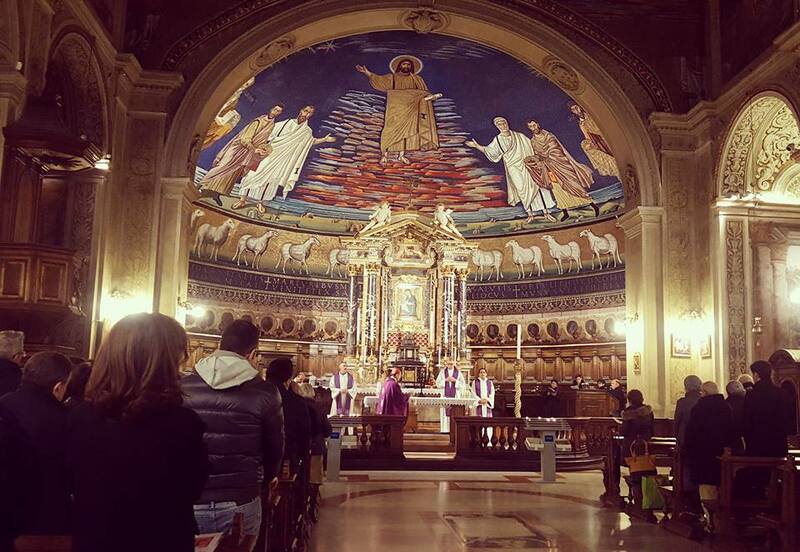 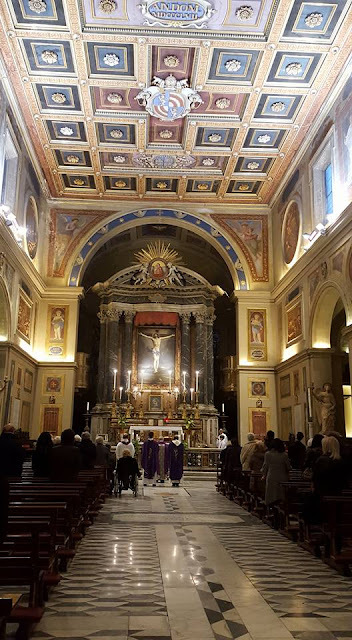 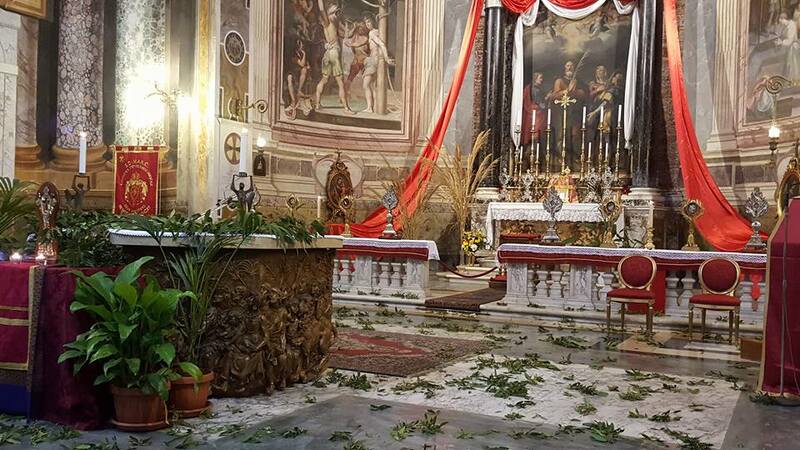 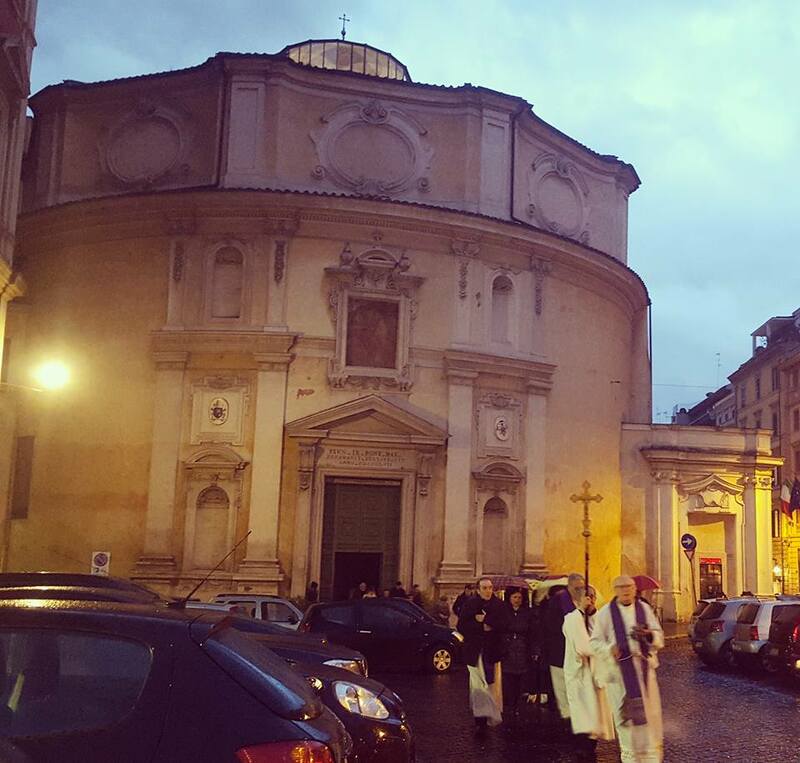 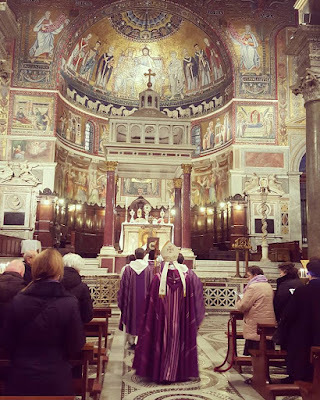 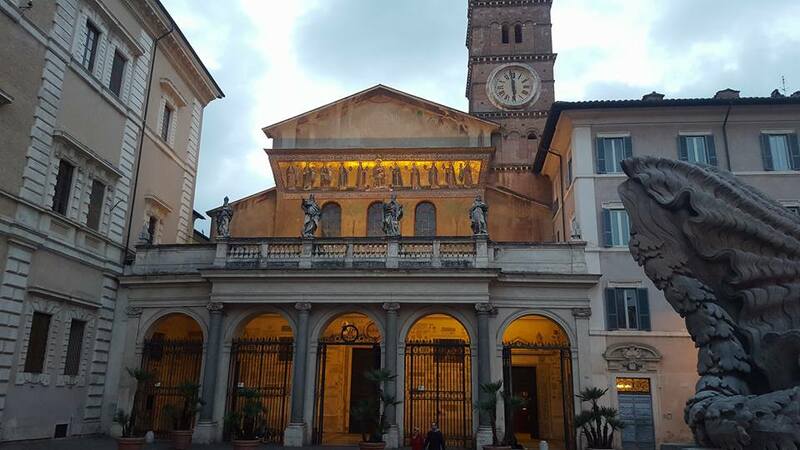 The beauty of this church today hides well the fact that in when Stations were instituted for the Thursdays of Lent by Pope St. Gregory II, (715-31), Trastevere was one of the poorest and least well-kept areas of the city, highly vulnerable to the winter flooding of the Tiber. 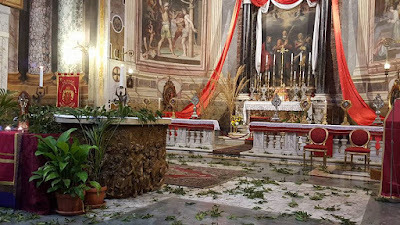 The traditional Gospel of this day, of Lazarus and Dives, (St. Luke 16, 19-31) was almost certainly chosen for this reason, as a highly pertinent reminder to the rich of their duties towards the poor. 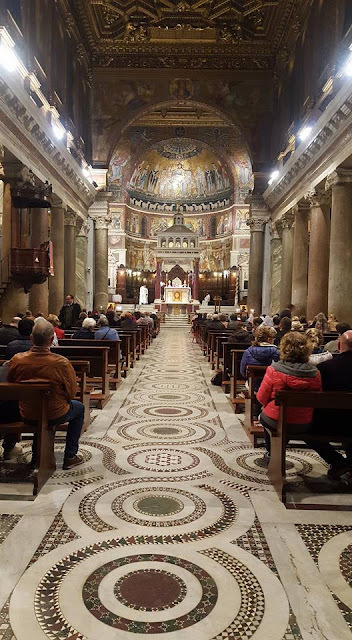 Many of Rome’s churches still preserve this Medieval style of mosaic, known as Cosmatesque; this floor is from the mid-12th century. 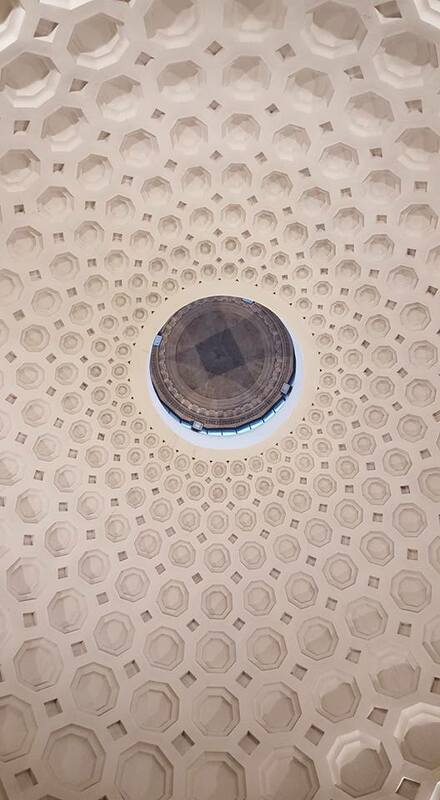 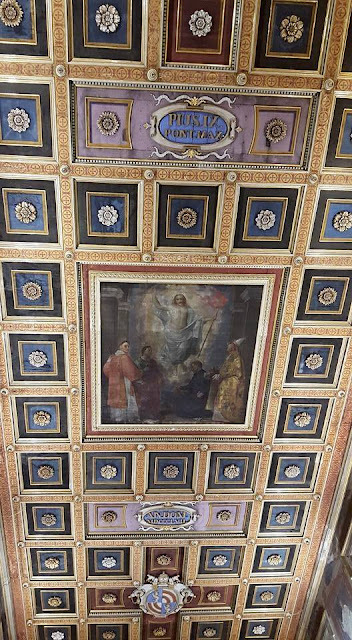 The individual strips of white marble and the colored tiles are both taken from the walls of ancient Roman buildings, which by the Middle Ages had long since fallen into decay. 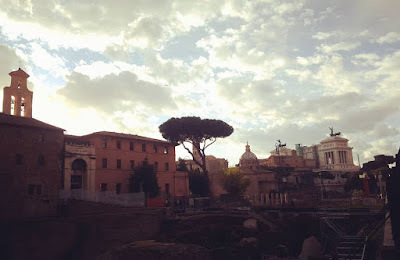 Much of the material had been brought to Rome in ancient times from the furthest corners of the Empire; the purple stone seen here, called porphyry, came from Egypt, and the green serpentine is from Asia Minor. 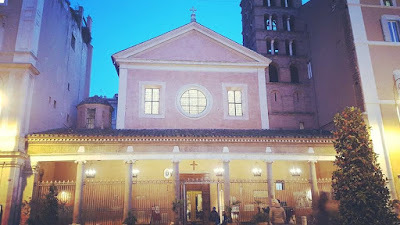 Before the massive renovations of many Roman churches in the Renaissance and Counter-Reformation periods, the style was commonly used not just in the floors, but all over the buildings. After this, our Roman pilgrim Agnese was out of town for a few days, and missed several of the Stations. 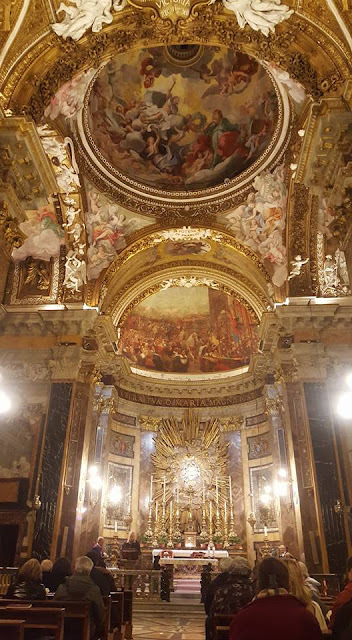 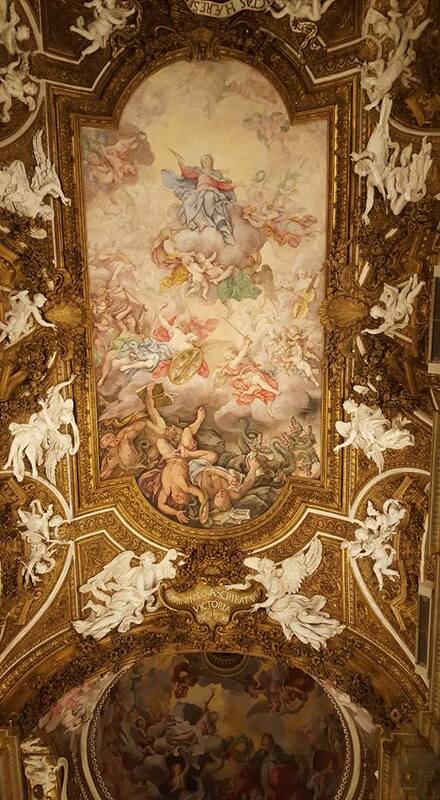 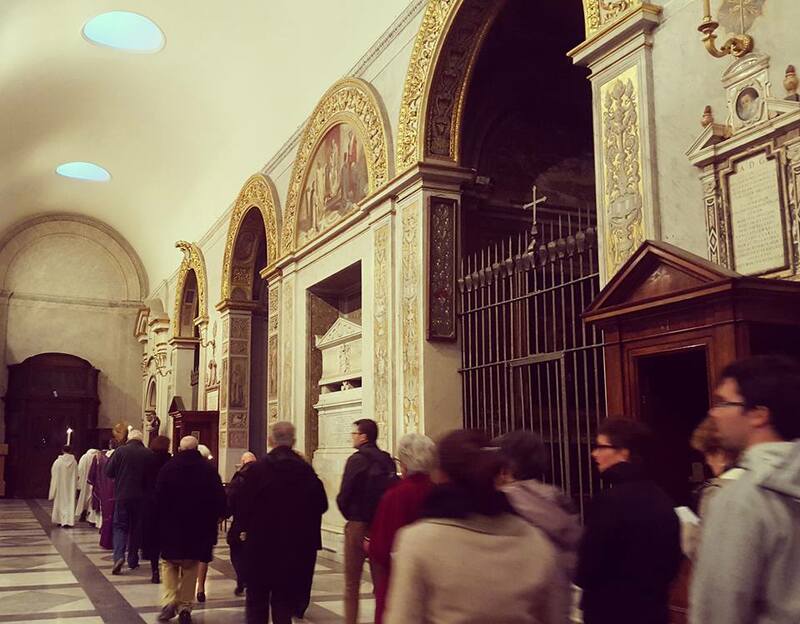 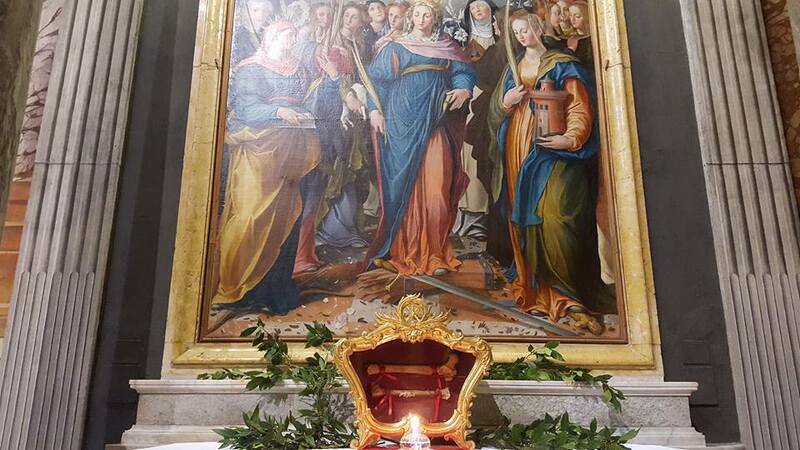 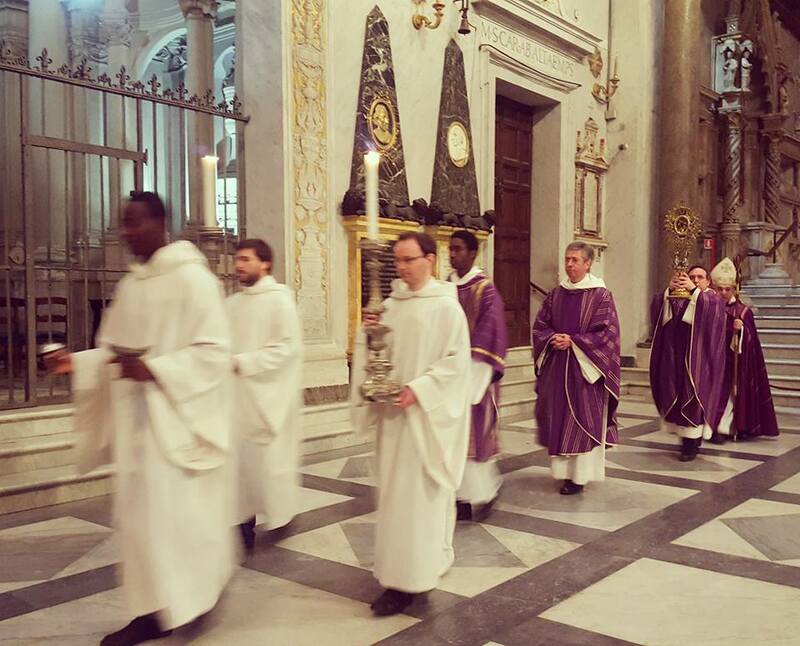 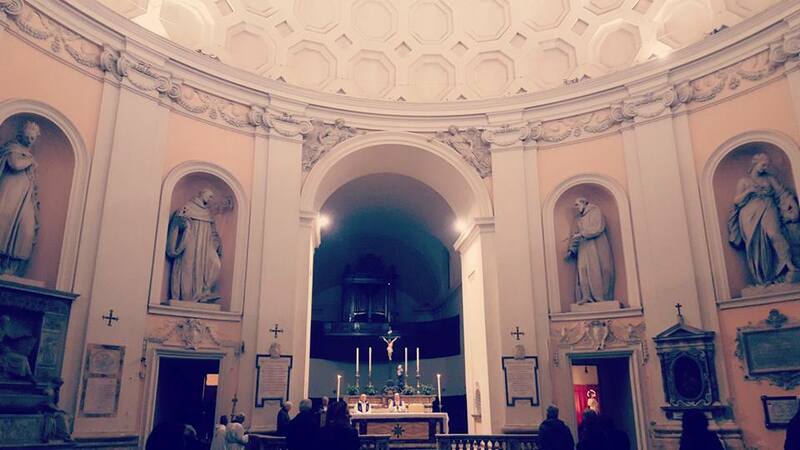 The high altar is graced by one of the finest painting of one of the great masters of the 17th-century, Guido Reni. 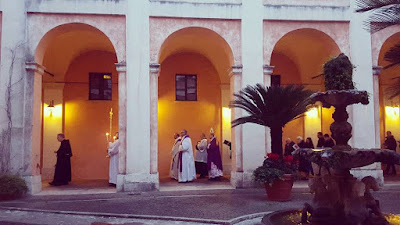 Even when standing out in the piazza in front of the church, one can see the pale body of Christ in the painting as if it were floating above the altar. The church of Santa Susanna is still under restoration, the third year in a row I have written this for today’s Station. 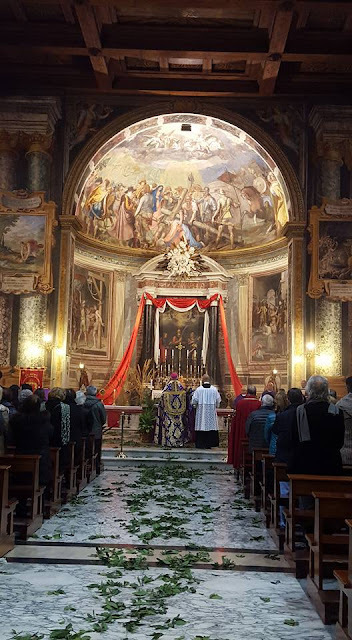 Fortunately, it sits on a piazza with two other churches, so the faithful gathered in one of them, San Bernardo alle Terme (first three photos), then processed past Santa Susanna to Santa Maria della Victoria next door for the Mass. I have written previously about the fountain seen here to the right of Santa Maria della Vittoria’s façade, and the hideous lump of a statue of Moses in the central niche. The article, published in 2011, described the restoration of four great monuments of the Counter-Reformation in Rome. 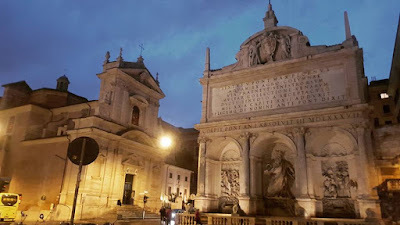 At the time, I noted that “When I first visited Rome in the summer of 1995, the Fountain of Moses had just been cleaned; before the most recent restoration, it was covered in black grime, and will likely be so again before too long.” This has indeed already come to pass, the whole fountain is completely filthy again.